Heat oven to 325°F. Spray cookie sheet with cooking spray. In 10-inch skillet, melt butter over medium heat. Stir in 2 tablespoons sugar, the orange juice, cinnamon and red pepper; cook over medium heat 30 seconds or until blended. Stir in pecans, tossing to coat completely. Remove from heat; spread pecans on cookie sheet. Bake 15 minutes, stirring once or twice. Cool completely. 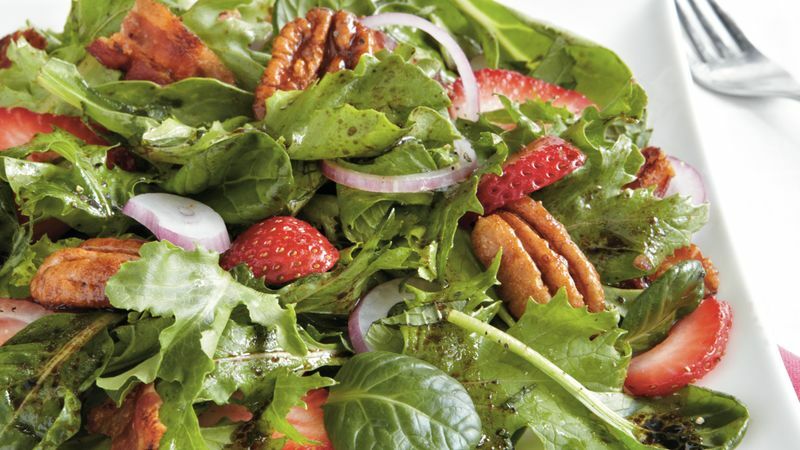 In salad bowl, toss greens, strawberries, mint, bacon and onion. In 1-cup glass measuring cup, mix dressing ingredients with wire whisk. Just before serving, drizzle dressing over salad and toss to coat. Sprinkle with sugared pecans. In winter months, substitute a sectioned navel orange for the strawberries in this salad and use the parsley.